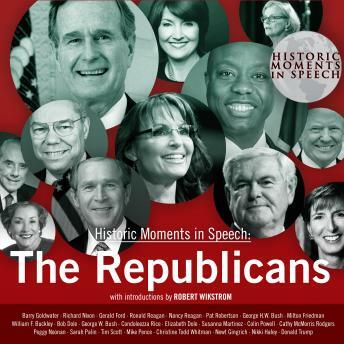 Republican Party spokespeople include presidents, advisors and candidates. Speeches are given by Barry Goldwater, Richard Nixon, Ronald Reagan, George H. W. Bush, George W. Bush, Donald Trump, and others. Words that support the party line and meant to win elections. Produced by the Speech Resource Company and fully narrated by Robert Wikstrom.